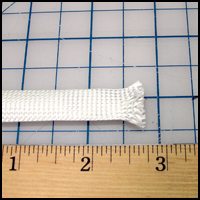 Fiberglass Braided Sleeves - CST The Composites Store, Inc.
Fiberglass Braided Sleeves - 0.236" Dia., 2.1 g./ft. Fiberglass Braided Sleeves, 0.236" Dia., 1-9 ft.
Fiberglass Braided Sleeves, 0.236" Dia., 10-24 ft.
Fiberglass Braided Sleeves, 0.236" Dia., 25+ ft.
Fiberglass Braided Sleeves - 0.394" Dia. Fiberglass Braided Sleeves, 0.394" Dia., 1-9 ft.
Fiberglass Braided Sleeves, 0.394" Dia., 10-24 ft.
Fiberglass Braided Sleeves, 0.394" Dia., 25+ ft.
Fiberglass Braided Sleeves - 0.591" Dia., 3.2 g./ft. Fiberglass Braided Sleeves, 0.591" Dia., 1-9 ft.
Fiberglass Braided Sleeves, 0.591" Dia., 10-24 ft.
Fiberglass Braided Sleeves, 0.591" Dia., 25+ ft.
Fiberglass Braided Sleeves - 0.75" Dia., 7.6 g./ft. Fiberglass Braided Sleeves, 0.75" Dia., 1-9 ft.
Fiberglass Braided Sleeves, 0.75" Dia., 10-24 ft.
Fiberglass Braided Sleeves, 0.75" Dia., 25+ ft.
Fiberglass Braided Sleeves, 0.75" Dia., Price per lb. Fiberglass Braided Sleeves - 0.984" Dia., 4.3 g./ft. Fiberglass Braided Sleeves, 0.984" Dia., 1-9 ft.
Fiberglass Braided Sleeves, 0.984" Dia., 10-24 ft.
Fiberglass Braided Sleeves, 0.984" Dia., 25+ ft.